Dubai With Kids: A Sense-sational Guide By Tara Sharma! theIndusparent have partnered with Holiday Inn® to inspire your next family adventure. 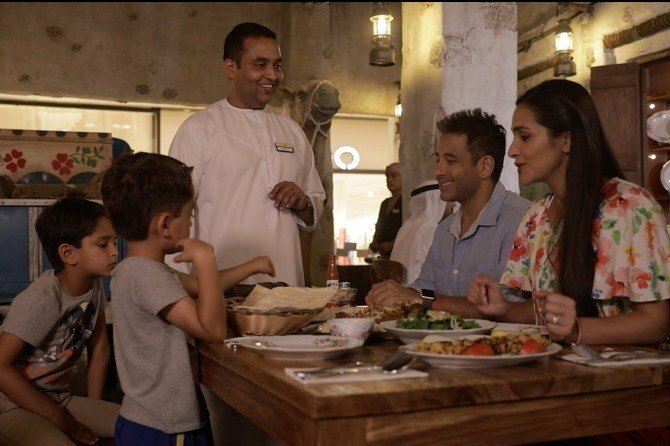 Travel with celeb mum Tara Sharma for a unique way of exploring Dubai with kids! Bollywood actress and celebrity mum Tara Sharma is no stranger to Dubai. She’s been a frequent visitor to the Emirate’s City of Gold for a decade now, for both work and leisure. Tara even shot a song sequence for one of her well-known Bollywood films, “Om Jai Jagdish” (2002) on the sand dunes of Dubai! Recently, Tara re-visited the same rolling sand dunes as well as some other hidden gems of this wonderful city. But this time, she had her two adorable munchkins and husband in tow, with a challenge to discover the city in a very special way. What was the challenge? It was to explore this sparkling city through their five senses of taste, sight, touch, smell and sound. We wanted to know more about this intriguing method of exploring Dubai with kids, so we got chatting with Tara to find out exactly how and why she did this. You can also watch the video at the end of the article to see how she tackled this challenge! Dubai with kids: A sense-sational experience! Some of the most amazing memories you get from travelling with your family are recorded through a multi-faceted process of sensation - the sights, smells, tastes of a destination linger on long after you return home. And this is exactly what Tara realised and wanted to explore further with her family. The challenge was not only for her but for the entire family. How did the kids react when she told them that they were going to experience Dubai through the five senses? “I think they were surprised but they were also curious. Curiosity makes kids enthusiastic about certain things,” she says. Tara also explained that her boys had already learned about the five senses at school, which heightened their excitement about the holiday even further. Naturally, as a family, they had a discussion about this unique way of discovering Dubai before heading there. But at the same time they did not want to make the whole trip too academic by going into too many details about the process. “As a family holiday, the priority was to relax and enjoy it and the learning that happens along the way is always a benefit,” she says. When they started off for Dubai, they did not have any specific learning in mind. “The way we had structured the trip was that each outing was exploring one specific sense,” says Tara. “It was not possible to explore just one sense at a time,” she says, adding a caveat. Some senses overlapped during an event or while enjoying an attraction. Sounds natural enough! Here are the major highlights of Tara and her family’s exploration of Dubai employing the five senses. To explore the sense of sight, Tara’s family visited Dubai’s IMG Worlds of Adventure, which is Asia’s largest indoor park. 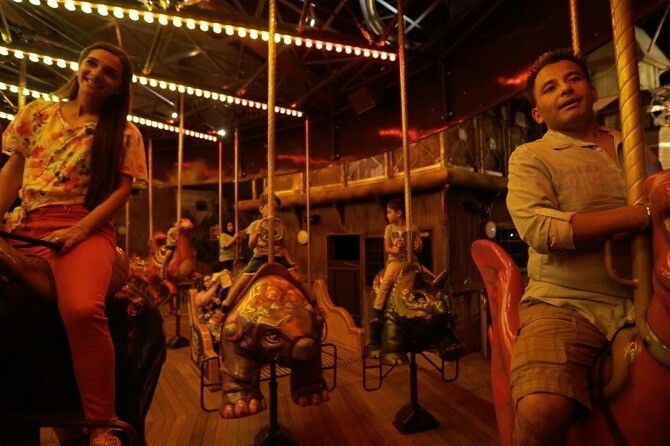 One of the attractions in the park was the merry-go-round that had various species of dinosaurs mounted on it instead of regular ponies. Tara explains that the carousel was less energetic than what the boys were used to, but they still had a blast! Also, the beautifully painted dinosaurs were a treat to the eyes! Another visual sensation at this park is the Avengers Battle of Ultron Ride. Here, you’ll join Marvel heroes such as Iron Man and Thor in an intense battle to defeat the villain Ultron – and all this in sharp 3-D clarity! Among the outdoor activities, the entire family enjoyed the sand-surfing experience quite a lot. It was challenging and at the same time great fun for them. This even became the highlight event of their Dubai trip! With the heat of the sun kissing their skin and the feel of sand between their toes, their sense of touch was certainly set alight. “The hot favourite among the activities was sand-surfing and the wadi bashing (sand-bashing),” Tara remembers with a good deal of excitement. “Kids could do it so easily. They were falling all over the place!” she adds. Coincidentally, these were the same sand dunes where she shot the film Om Jai Jagdish over a decade ago with her co-star Abhishek Bachchan, and now, here she was with her kids trying out things she had never done previously! The scorching heat of Dubai failed to dampen the spirits of the boys, teaching them lessons of grit and resilience. The up and down journey to the sand dunes itself was rather challenging. “It’s quite scary in the Land Rover,” she remembers, as the wheels swerve and slip dangerously on the sand dunes. But this experience too just added to the overall sense of adventure they all enjoyed so much. Enjoying delectable local delicacies provided Tara’s family with plenty of opportunities to deploy their sense of taste. They decided to tickle their taste buds with Emirati food. “We really focused on the taste aspect,” Tara says. “It was again interesting for the kids because they were more curious to try. As kids can be fussy, the curiosity for exploring the taste got them to eat better. The Emirati cuisine is very similar to Indian cuisine. They were actually quite happy because they had bread and naan and they enjoyed it.” The restaurant’s decor, with a fake camel inside it, added to the whole Emirati ambience. 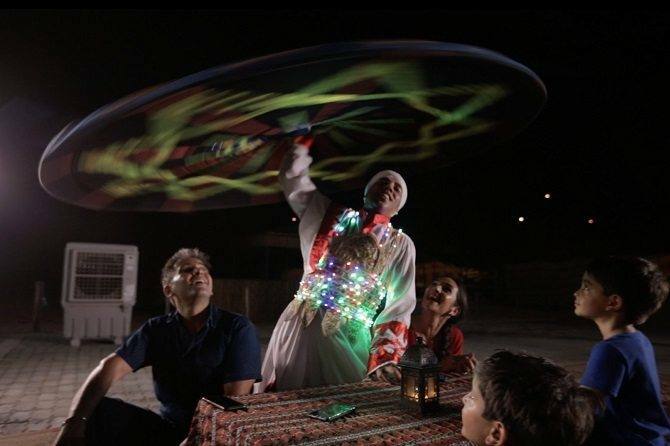 Tanoura dancing (a kind of folkloric dance developed from sufi dance in Turkey and Egypt, distinguished by the use of a multicoloured skirt) provided the right outlet to explore the senses of sound and sight for Tara’s family. When the dancer’s body moved in a rhythmic confluence with the Arabian music, the brightly neon-lit skirt (“Tanoura” means “skirt” in English) swirled in the air, creating a magical effect. Tara and her kids enjoyed the dance and Tara, along with her husband, tried some moves with the performer. Despite having loads of experience with Bollywood dance, Tara admitted she was a bit embarrassed to make these moves, but she still managed to pull it off! The kids had a good laugh throughout the performance, but were too shy to try out the dance moves themselves. While exploring the city, Tara and her husband had some me-time too, thanks to their little ones keeping each other occupied. “The siblings were great companions to each other. They played together quite a lot, including playing imaginary games, and kept each other entertained,” she says. To stimulate their collective sense of smell, Tara decided to take her family to the Spice Souk, or the market of spices. “It’s very impressive. Again having been to Dubai several times, I never visited the Spice Souk. Visually and fragrance-wise it was very interesting as there were various smells and we were encouraged to ask about it and the kids could ask about it,” she remembers fondly. Many of the spices in the market were familiar to her and her family, but some were new to them too. “The visit was nice as it makes you realise sometimes what you overlook. You see things that are different and things that are similar (to what you see in India) and then you can relate to things,” she says. 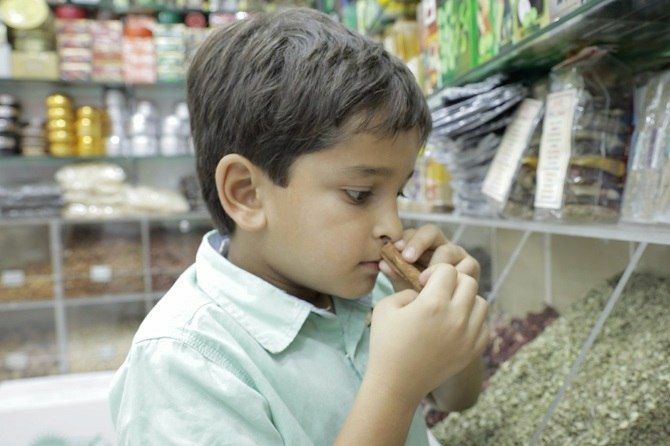 In the spice market, the senses of touch and smell mingled as the kids felt the textures of the various spices and inhaled their gorgeous fragrances. The walk through the Spice Souk stayed with Zen and Kai even after they returned to Mumbai, India. They had even taken some spices home and the boys were excited about showing them to their grandmother, and talking about what they had seen. Exploring Dubai with the five senses offered a culturally rich experience to Tara and her family. Dubai being a cosmopolitan city, the children were exposed to some foreign languages too. For example, they picked up some Arabic phrases. Tara’s husband knows a little bit of Arabic and he used a smattering of it here and there and kids were inspired by it, says Tara. For Tara and her family, their stay at Holiday Inn® Dubai was also very enjoyable. The rooms were spacious and family-friendly, the staff were lovely and friendly, and the hotel provided a safe environment. Its location was very convenient as it close to a mall which had a play area for kids. The hotel had good food and offered kid-friendly activities too. “I must say Holiday Inn® was a lovely place to stay--it was a very nice hotel room-wise and had a lot of space. Kids really enjoyed their stay there. People were very nice,” she says enthusiastically. Tara could really relax and enjoy the trip as the itinerary was planned by the host, Holiday Inn®. “Going on a planned trip with people who are taking care of your activities is quite an amazing thing,” she admits, laughing sweetly. However, it does not mean that they did not do any of their own fun research. To explore the Emirate’s paradise island involving the five senses, her family found the Little Big Travellers website very useful. “I am not very tech savvy but the kids are. They were very excited to click on the Little Big Travellers website and figure out what to do. When you are on a short trip, efficiency is also quite important. It was quite nice and clear and helped us to choose the places,” she says. Tara believes that travel is a wonderful way, for both adults and kids, to explore and learn so much about the world- we learn about new cultures and become empathetic towards other people and places. In a nutshell, travel teaches you more than you ever thought it could! Tara’s recommendation is that all mums and dads and their little ones go out and travel wherever possible. She also encourages all forms of travel. “Not everyone can go on international trips. I think any kind of outing, whether it is local or a short journey or long one, it just opens your mind. It shows you that there is a bigger world out there,” she says. We couldn’t agree more! Happy travels to you, mums, dads and kids!